The first dress watch from the relatively new (founded in 2010) watch brand, Ressence, will no doubt be a crowd favorite on 15th January, as SIHH opens it doors to the press. Ressence will present their latest piece in the line-up, the Type 1 Squared in a numbered, but not limited, series and we are excited to get our hands on it. Ressence deserves a lot of credit for captivating even the most traditional of watch enthusiasts with designs that are as unique as they are technical as they are exciting. Keeping with the Ressence motto #Beyondhands, the Type 1 Squared maintains the signature orbital time display of the previous line-up (if you haven’t seen this, make sure you click here to check this out), this time presented in a 41mm stainless steel cushion case sitting 11.5mm thick. Based around the original Type 1, this piece denounces the presence of a typical crown and incorporates it into the case back giving the front of the watch unprecedented clean lines. To wind the watch and set the time and date a fold-out lever is deployed from the case back which is rotated clockwise and counterclockwise. Powered by a ETA 2824 automatic movement, this piece only offers a 36 hour power reserve. A point that may not be a problem with this particular piece, given you wont want to take it off your wrist. 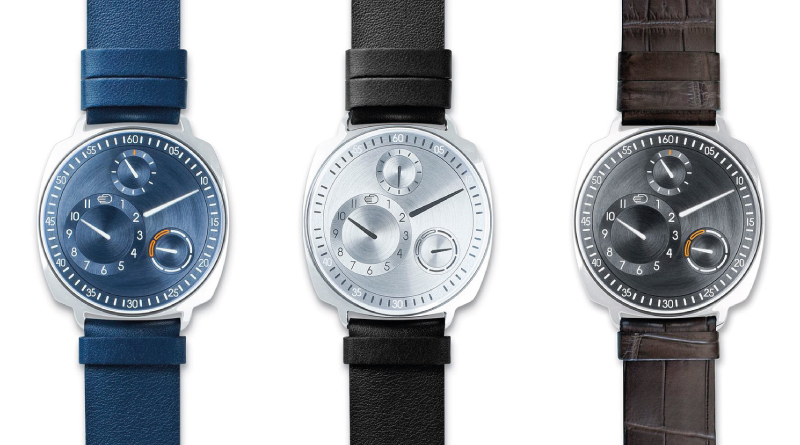 Unlike the the Ressence Type 3 and Type 5 models, the Type 1 Squared does not have the oil filled dial, but nor should it. This is a dress watch after all and the liquid filled Type 3 and Type 5 are divers, which encounter the refraction of light as they plunge underwater. To continue the trend of firsts for this Type 1 Squared, this will be this first Ressence to be made from Stainless Steel (the rest of the line up boasting a titanium case) and will be their most accessible piece with an MSRP of $20,600.